Cardinalsin wrote: Not as funny though but C+ for effort. So they asked Asura in Crestfall to help them out as best he could, which he did. 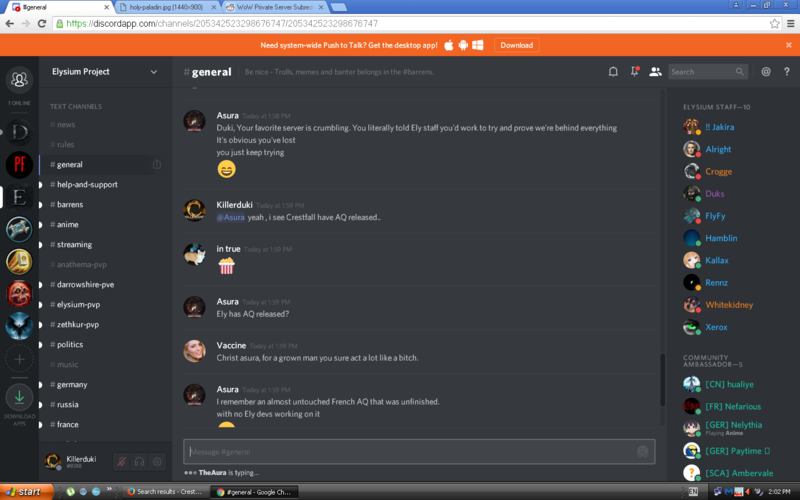 So I'm sure your ''I have great relationship with Elysium staff'' line is worth nothing at all, because you can't help them one bit. You might as well team up with Alexensual as you more than deserve one another. In the meantime, you can look forward to getting the fixes and development Elysium needs to stabilise it and move to the next level, courtesy of their friends in Crestfall. Must hurt playing on a server that depends on Crestfall to keep it functioning. Oh , the Shits started too early. Last edited by smilkovpetko on Tue Feb 21, 2017 11:13 pm, edited 1 time in total. What shady practices indeed? After all, the server hasn't even launched yet and no donations have been made. So would you care to elaborate? To be clear, on the server you are currently on you have zero developers. They've either left or been fired. The actual owner of the server (not Shenna) has been accused with some substantial evidence to be colluding with Chinese farmers for his own benefits. The administrator (Shenna) went on a filthy expletive rant https://forum.elysium-project.org/topic/38777-you-want-transparency-here-it-is/ where everyone is to blame bar her and the owner. Very professional. Suzerain has left but gave us a brief insight into how bad things are https://forum.elysium-project.org/topic/38777-you-want-transparency-here-it-is/ where Shenna stitched him up to protect the owner. He also says that Tyche (CM) abused his commands. Lead GM's Nightmare and Hades have quit the team. Now Elysium isn't finished, because the majority of the players there don't care about the drama and popcorn, they just want to play. Problem is, there's no future because you have no developers. I'm sure they can copy & paste AQ40 from TRB when they release their code and try and hackfix it on to suits. But Naxx? You picked the wrong horse boys, you picked the mule that couldn't script AQ40 over 6 years, the guys who operate back door deals with Chinese Gold Selling sites. Having said all that, I personally would welcome you to the CF forums. We still have yet to do Beta testing for Paladins, you still have the chance to be a part of our community. Please reconsider, because you're not stupid. Cardinalsin wrote: You picked the wrong horse boys, you picked the mule that couldn't script AQ40 over 6 years, the guys who operate back door deals with Chinese Gold Selling sites. You can say what you want. but the fact remains that Elysium is up & running, and Crestfall is just vaporware. Better to have no track record and hope compared to a Valkyrie track record of nope. We are quietly confident and will back it up this year.